I've been waiting to make this drink a long time. This is mostly due to my need of yellow Chartreuse. Yellow Chartreuse is still the herbaceous and fruity alpine liqueur from Carthusian monks in France. It is less potent and is sweetened with honey, so it is sweeter and lighter than the green variety. Both of these dragon drinks with their medieval-era liqueurs and lush cognac really play up the sense of high fantasy. It is easy to imagine while drinking this potion that characters in The Lord Of The Rings might enjoy something with these magical flavors. 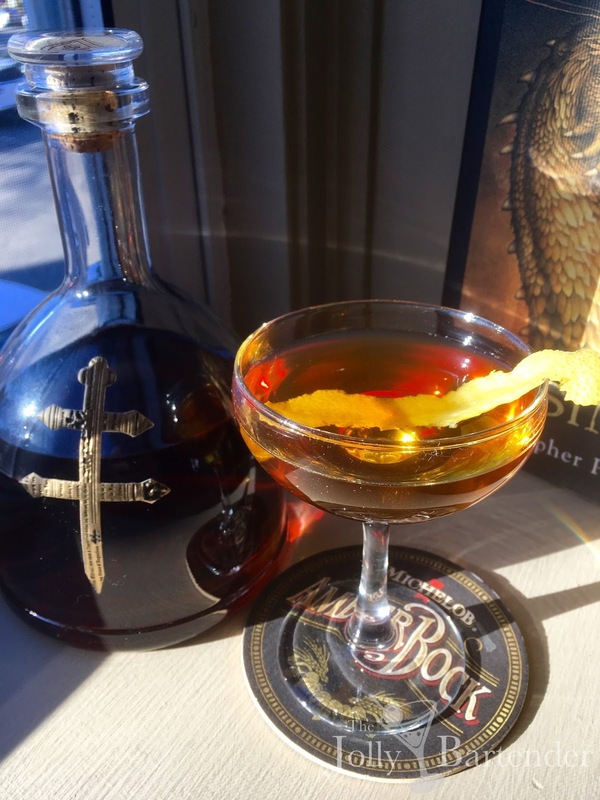 D'usse cognac has a fantasy-like bottle that goes well with this theme--a hammered and etched metal cross label on the front of a blown glass beaker. Even the lemon twist has a scaly, golden look to it. Combine Chartreuse and cognac in a mixing glass with ice. Stir and strain into a chilled cocktail glass. Garnish with a lemon twist.